On January 24 this year, the U.K. Supreme Court delivered a verdict in R (Miller) v. Secretary of State, where the core question for determination was this: Could Britain exit the European Union “without prior legislation passed in both Houses of Parliament?” The government, having invoked Article 50 of the Treaty of the EU, which stipulates the process to be followed by member states that desire to withdraw from the convention, argued that the power to withdraw was a purely executive prerogative. The court disagreed. It ruled that an Act of Parliament was a prerequisite for Britain’s exit from the European Union. The court’s decision ultimately turned on certain basic conceptions of constitutional law. In its judgment, it held that the rights of individuals flowing from legislation that was enacted as a consequence of the U.K. joining the EU could only be removed or reduced by the enactment of fresh parliamentary legislation. On the face of it, these findings might not appear to have set a precedent of any universal value. But a closer examination of the verdict’s rationale would show that the decision bears a significance that transcends borders, providing to us a framework to comparatively examine the role of the courts and the significance and limitations of judicial review. For example, an immediate parallel can plausibly be drawn between the verdict on Brexit and the approach of the American federal courts in response to President Trump’s travel ban, which, through executive fiat, targeted visa applicants from six Muslim-majority countries. When the U.S. Supreme Court ultimately decides on the legality of the travel ban, there might be much to be gleaned from a comparison of these two verdicts, on the nature of the political responses to the decisions, the manner in which power is balanced between the different agencies of government, and the result that they have on the countries’ respective democratic setups. These kinds of exercises in comparing decisions by different constitutional courts might well be fraught with difficulties, especially when there is a lack of a shared history and politics between the countries under comparison. 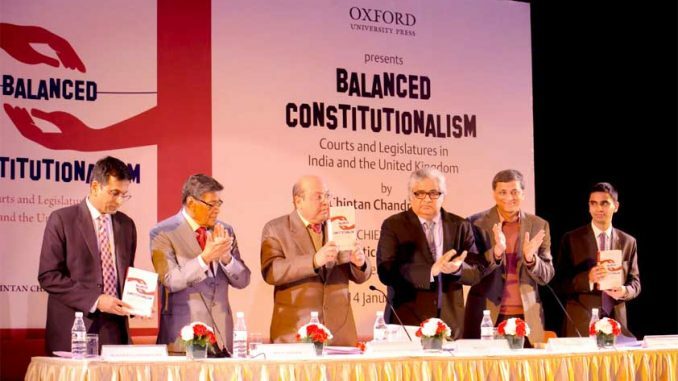 But they are nonetheless valuable, as Chintan Chandrachud’s excellent, new book, Balanced Constitutionalism: Courts and the Legislatures in India and the United Kingdom, shows us. Here, the author’s scope of comparison might be narrow — he concentrates primarily on probing the British experience of judicial review under the Human Rights Act, 1998 [HRA] and the model of examination followed by the Indian courts under the Indian Constitution — but the nature of his findings, in what they tell us about the role played by India’s judiciary, is remarkably salient. Through examples, Chandrachud shows us how the HRA encourages a more balanced division of responsibility between government and the courts, as opposed to the Indian Constitution, which allows for little possibility for dialogue and deliberation between the various wings of the state. This conclusion is predicated on a fundamental difference between the two systems of judicial review, which he commendably draws out. While in India, courts are generally required to declare as void laws that offend the Constitution, in the U.K., under the HRA, courts are allowed to make a “declaration of incompatibility.” That is, if a law made by Parliament is seen to conflict irreconcilably with the provisions of the HRA, the court can merely pronounce the existence of a condition of incompatibility. Such a declaration does not affect the validity of the law, but merely leaves it to the wisdom of Parliament to decide whether to cure the defect, either through a repeal or through an amendment to the law. This curb on the courts’ power, Chandrachud points out, allows the judiciary in the U.K. greater flexibility in testing a law’s validity. In India, on the other hand, the enormous power that the Supreme Court enjoys, somewhat counter-intuitively, proves limiting. Judges are often reluctant to strike down a law, because of the majoritarian sanction that a legislation might enjoy, finding thereby a compatibility between the statute under question and the Constitution when none exists. One of the examples that Chandrachud cites is the Indian Supreme Court’s 1994 judgment in Kartar Singh v. State of Punjab, which, when viewed along with the House of Lords’ 2004 verdict in the Belmarsh Prison case, reflects “the refusal of Indian courts to articulate their genuine rights reasoning.” In Kartar Singh, the Supreme Court upheld large parts of the Terrorism and Disruptive Activities (Prevention) Act, 1987, despite expressing a sense of deep distress and concern over some of the practices that the legislation endorsed, largely because of the “gravity of terrorism that was endangering the nation.” Whereas, in Belmarsh, the House of Lords declared as incompatible with the Human Rights Act, various provisions of the Anti-Terrorism, Crime and Security Act, 2001, undeterred by apparent national security considerations. As Chandrachud himself notes, comparative constitutional law is still a nascent field. But Balanced Constitutionalism is a work that adds great value to this growing discipline. The nature of Chandrachud’s analysis and the conclusions drawn out by him ought to appeal not only to lawyers, but to any person interested in the study of governance and constitutionalism.